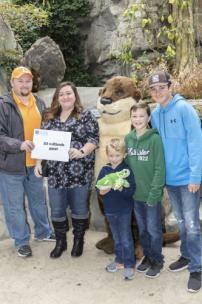 Amanda Roe from Bristol was the Tennessee Aquarium’s 25-millionth guest on Saturday afternoon. They came to Chattanooga this weekend to visit the Tennessee Aquarium for the very first time. Shown are Michael, Amanda, Tyler, Jacob, and Michael Roe. On Saturday the Tennessee Aquarium celebrated the passage of a major milestone with the arrival of its 25-millionth guest since opening in 1992. Amanda, Michael, Michael, Jacob, and Taylor Roe from Bristol, came to Chattanooga to visit the Tennessee Aquarium for the very first time. Ms. Roe was surprised to learn she was the aquarium’s 25-millionth guest. “We wanted to come down to Chattanooga to spend the weekend with our family,” she said. In recognition of their important place in the 26-year history of the Aquarium, the lucky group was surprised in the River Journey building with a collection of prizes valued at more than $1,000 and guaranteed to inspire a return visit. The reward package included complimentary tickets to the Aquarium and IMAX 3D Theater, $250 toward purchases in the Aquarium gift shops, a special behind-the-scenes tour, a VIP pass to more than 20 Chattanooga-area attractions and a voucher to return to Chattanooga to stay in the new Edwin boutique hotel. The Tennessee Aquarium opened its doors on May 1, 1992. In the years since, the non-profit organization has achieved remarkable success without drawing on city or county tax money. The Aquarium consistently receives top ratings in customer satisfaction on TripAdvisor and was listed as one of the world's top aquariums in 2018. Since opening, the Aquarium has contributed more than $3.3 billion to the local economy through non-local visitor spending. Families like the Roes, who come to Chattanooga to enjoy the Aquarium, create cherished memories together while generating a $115 million dollar annual impact on the city and county. Celebrating the Aquarium’s 25 millionth guests also honors the generations of visitors who preceded them and who experienced countless unforgettable moments of their own, says Aquarium President and CEO Keith Sanford.